This is the best time of the year if you like blackberries. They are getting ripe all over the place (the ones shown here grow in Albany’s Waverly Jewish Cemetery), but as you can see they’re not getting ripe all at once. That’s a good thing because it allows us to enjoy them for several weeks. 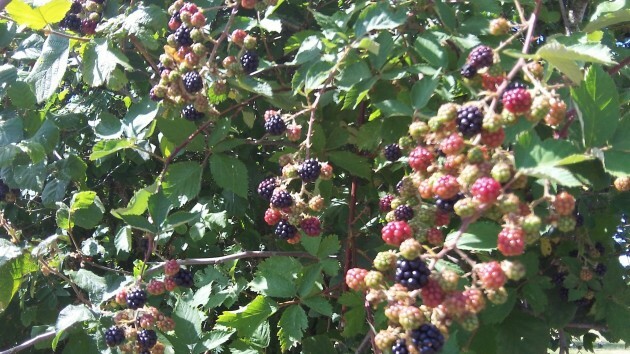 The bad news: There’s a war on against blackberries. At least one variety is considered an invasive plant, and municipal authorities and others are doing their best to keep it under control, if not to wipe it out. In Bryant Park, for example, berry vines have been hacked back from the drive through the park, foiling would-be berry gatherers and even the casual snacker. Another downside of this campaign is that fragments of thorny vines often end up on the pavement, and if you’re not careful to avoid them on your bike, a flat is the likely result.